In a world that seem to be gradually moving towards working and mixing 'in the box', there are still situations where hands-on control is second to none. Monitor control is one of those cases. Enter MOM - our Monitor Operating Module. We never settle for 'the standard solutions' and MOM is no exception to that rule. So there is one feature - and knob on the control surface - that is unique to MOM. Now, why would you want that? 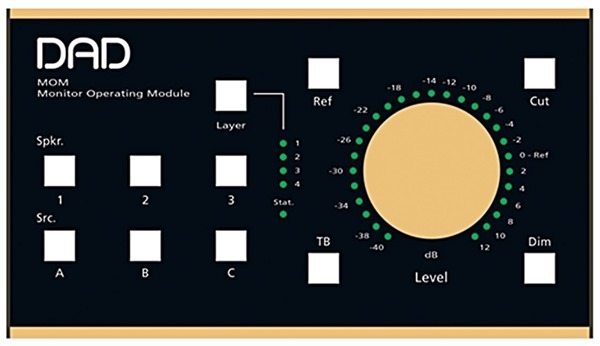 Well, even though some of the knobs are labeled - and setup by default - to select speaker sets and sources, you can alter what functions they should control freely. Imagine having up to 4 different versions of this controller - each tailored for specific tasks within your production workflow - that you can switch between in seconds. Another useful application for the layers are for large production rooms where many engineers share the controller. Now, each could tailor their own preset that suits them perfectly. Or in the case where an external producer or director sometimes attends mixing or tracking sessions. Then you could add more MOMs to the room and assign different 'user roles'. Not everyone has to be able to control the Master Volume. MOM is ready to enter any AX32, DX32R or Avid MTRX-based production environment and will integrate seamlessly with your setup. Thanks to its compatibility with the EUCON control protocol, MOM will easily synchronize and co-exist with other control surfaces, including Avid's S3 and S6 consoles, Dock Control and the Pro Tools Control App for Apple's iPad. As mentioned, MOM is a hardware remote and you will need an AX32 or DX32R with the optional PRO|MON|3 software license.